It's no secret that PricedOut think that house prices have become far too expensive. A roof over your head is an absolute basic that everyone needs to be able to afford. Therefore it's interesting to compare house prices to the cost of another life essential - food. In 1970, a family of four spent £10.70 per week on food, compared to £52 per week nowadays. That means food now costs five times more than it did 40 years ago. Back in 1970, the average house price was £6,000. 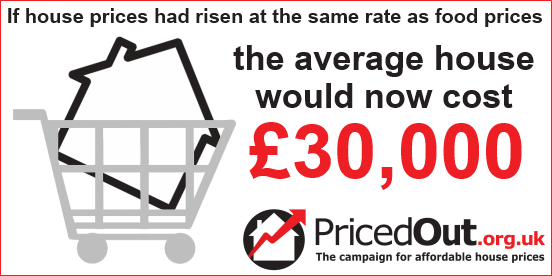 Applying that same five-fold increase we saw with food prices would make today's average home cost £30,000. Of course house prices are nowhere near that now. This week's official statistics showed that the average house price has now hit the £250,000 mark. There is a cost of living crisis in the UK, and the housing market is to blame. Not a good comparator. Under Nixon the US embarked on a “cheap food” policy which has since been emulated across much of the world. The result of that can be seen wobbling along every high street unless the victim has already become bedridden. Cheap food is an illusion, it’s poor food and this will be the first generation to outlive many of it’s children. You might equally have compared property prices to say postage stamps or international telephone calls. Today’s value (not price) of a Penny Black of 1840 is around £3 and not even Royal Mail would have the audacity for that. Equally, the cost of a telephone call to from the US to the UK in around 1960 was $3 a minute! Today? About a penny, funny that. Both of the above examples have of course been affeced by advances in tecchnology and global population movements demanding better, cheaper, and faster communication. Unfortunately, that has also brought a burdgeoning increase in the UK’s population over and above organic growth. Housebuilding never will keep up with current population growth and equally with household formation rates which are increasingly of single people all demanding their own space. The international dimension should be dealt with through a number of controls including both absolute immigration and the purchase of UK property by non-resisdents in a similar way to Switzerland or Singapore (other countries being even more prohibitive). And why quote average house prices when few first time buyers buy an “average house”. It would be better, more credible, and easier to defend a comparison with entry level properties. On that basis there is still a differential between many income groups and prices but a true comparison should alsso factor in the very different interest rate environments, deposit requirements, mortgage availability (queues, remember?) and income multiples (3 plus a half). Our first flat near Croydon was around £25000 and today is about £185000, Combined salaries were about £8k and the same occupations would command circa £40/45k so stretched yes but on a starter rate of 2% infinitely more affordable than on 10% plus. Slow population growth, curtail immigration (this is not xenophobic), control non resident speculation, build more dwellings and make all forms of tenure available; many do not want the inflexibility of home ownership.